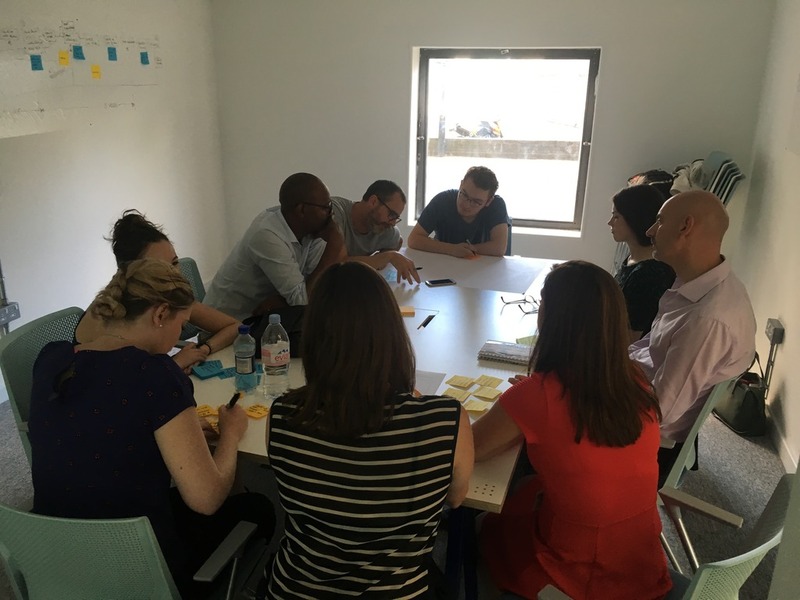 I spent Monday afternoon visiting the Health Foundry healthcare startup space to expand my horizons on what steps are being taken within service transformation in the NHS. The Health Foundry is a brand new collaborative workspace for people using digital technologies to improve health and wellbeing, based in Canterbury House by St. Thomas’ Hospital in Waterloo. Powered by Guy’s and St. Thomas’ Charity, they provide support and a working space for digital healthcare startups (including DrDoctor, who have just moved in), supporting them to create scalable digital health solutions. This is the where one of our teams (Martyn, Leon and Cale is based this week to carry out a one-week design sprint with Guy’s and St. Thomas’ NHS Foundation Trust. The pediatric allergy team there deliver the children’s allergy service (CAS) - a service provided to local families in Lambeth and Southwark, as well as to other children across the country who suffer with allergic disease, such as asthma, eczema, hay-fever and food allergies. With the current children’s allergy service not running as smoothly and efficiently as it needs to be, the hospital is taking a service transformation approach to focus on ways to improve this service for its users through digital. As I arrived, the team had just kicked off telephone user interview sessions. A set of long-term service users (the parents of younger existing patients of the department) joined the team to go through their experiences of using the service, from beginning to finish (from the initial appointment to final discharge) and raise any questions about the current service. These sessions are used as a two-way method conversation, also providing a platform for members of the team (NHS and Unboxed) to ask users any specific questions about their experiences with the service. Pain points are drawn from these interviews to identify where the current service may not be working as efficiently as it could be, also drilling down into the specific steps in the process that work efficiently and those that aren’t working so well. A series of subject experts were lined up to contribute within these early stages of the sprint in time-boxed “Ask the experts” sessions. These sessions were used to contribute towards developing a better understanding of where current problems lie within the service for key stakeholders (doctors), and for these children’s allergy service stakeholders to provide their individual insights and share their experiences. Throughout the user interviews and ‘Ask the experts’ sessions, the team had constantly been taking notes on post-its when hearing something of interest, then converting these into questions by adding “How Might We” to the beginning of everything written down. In the last session I attended, the room worked on sharing their “How Might We” notes from across the afternoon, getting these up on the wall for everyone to see and beginning to prioritise these post-its in terms of importance to the service. As I left, the team were preparing to dot-vote on the post-its they found to be the highest priority to the service. Quite a number of bases covered in a short time period. The sprint is continuing across this week, with a Show & Tell scheduled for Thursday and due to conclude on Friday afternoon. The team will be working towards creating a working user-led prototype of the new children’s allergy service to trial with real users at the end of the week.